Sandersonia commonly called Golden Lily of the Valley or Christmas Bells, is a member of the Colchicaceae family, and only one species has been recorded. They are now rare in their native habitat of Natal, South Africa, usually only seen in nature reserves. This exquisite tuberous plant is closely related to both Gloriosa and Littonia. Although all parts of this plant are poisonous, like all in the Colchicaceae family, the Zulu people were said to use the tuber as aphrodisiac. The plant which is completely dormant in winter emerges in late spring, making rapid growth and is in full bloom around Christmas time. The branched stems reach up to 2 feet (60 cm) in height and produce upwards of 25 glorious thimble-sized brilliant orange bells on dainty arching pedicels. 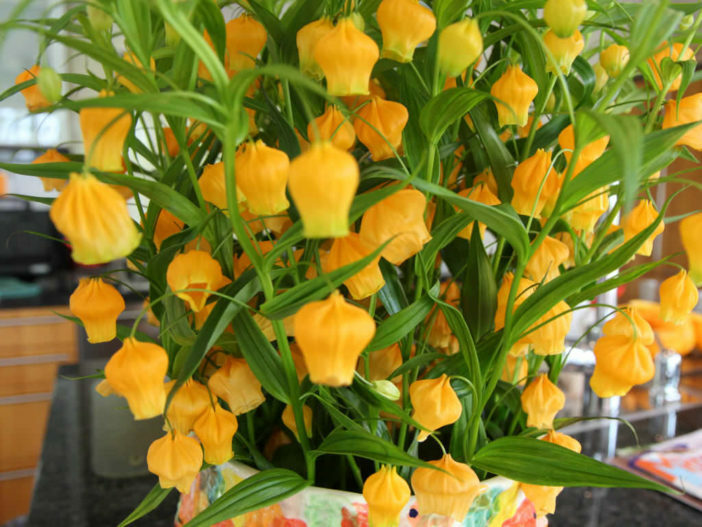 These bells are reminiscent of Chinese Lanterns and are very decorative. They are sold widely around the world as a cut flower, lasting up to 3 weeks in a vase. Sandersonia loves a sunny spot with well drained loamy soil enriched with complete fertilizer. They only require water during the growing period until the flowers have finished, we then find it to be more drought tolerant than we expected. However they do not like to be too wet over winter. The tuber has two fleshy prongs emerging from the central ‘bulb’. These prongs should be planted down and covered with 2 inches (5 cm) of top soil with about 3.1 inches (8 cm) between each tuber. When shoots emerge they need to be protected from snails and slugs as they find them most desirable. They will do well in a pot or container so long as there is good drainage. They increase by making a new tuber each from the growing prong and often a small ‘nut’ on the other prong. They can also be grown from seed which is usually ready to harvest about the end of April. Seed should be planted early winter, sown thinly in trays or pots using a very well drained potting medium and covered with 0.4 inch (1 cm) of mixture. This unusual South African is a splash of brilliant color at Christmas and well worth trying.